Image caption Les Merton told victims: "This is our little secret - our special game." 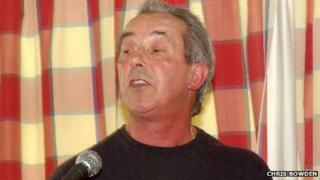 A Cornish bard and author has been jailed for 13 years for child sexual abuse. Les Merton, 70, from Redruth, was found guilty of 16 counts of indecent assault against girls as young as seven and four counts of indecency with a child. Truro Crown Court heard Merton would show them pornographic videos of fairy tales and make them drink alcohol before indecently assaulting them. He would also play cards and then ask the loser to carry out a sexual act. Merton told his victims: "This is our little secret - our special game." The offences happened between 1983 and 2004. Merton was made a bard in 2004, has written several books of poetry and is the author of a book called The Official Encyclopaedia of the Cornish Pasty. Judge Christopher Clark said: "Despite this there was a dark sinister and depraved side of your personality. The judge also passed a sexual offences order. Cornish bards are appointed by the Cornish Gorsedh, which honours people for "outstanding contributions to Cornwall and its ancient culture, history and language". Merton was given the bardic name Map Hallow (Son of the Moors) when he was conferred with the honour.